Yeowww! You were right, this water is FREEZING!! Chuck Norris at age 2. 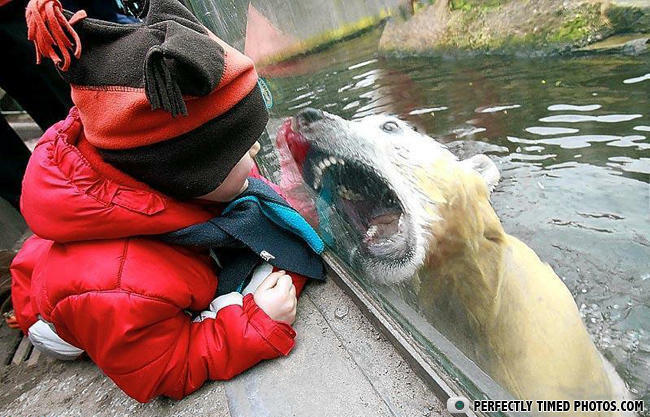 The glass is there for the bear's safety. HELP! KID GET IN HERE I'M DROWNING! there appears to be a forcefield blocking my afternoon lunch. There are two inches of plexi-glass seperating playtime from meal-time. Oh my God its a KIIIIIIID !!!!!!!!! "I SAID GIMME THE TREAT!!!" Do i have any cavities? Roar all you want fella you ain't gettin my Hershey bar. Mummy, can I keep it? "I just saved a bunch of money on car insurance by switching to GEICO!" mom have we some old (duck)bread? What did dyslexic Old McDonald say?